Earlier today, we informed you about a possible iPhone 4G/HD prototype which Engadget got hold of from the floor of a bar in San Jose, California. Later, MacRumors deemed them as fake, pointing towards a similar looking Japanese counterfeit product. But now, Engadget fires back with “solid” proof that the prototype images of iPhone 4G which they posted earlier were indeed real. The image that you see above is the one which was leaked a day before iPad was launched on January 27th. On closer inspection, it was later found that it also had an iPhone on top of it, along with an unidentified object on the right side. You can clearly see that this object on the right side resembles the images of the prototype which was leaked earlier. This is what Joshua Topolsky said. If you’ll recall, the night before the iPad was revealed, we had leaked shots of the device from what appeared to be an Apple test lab. 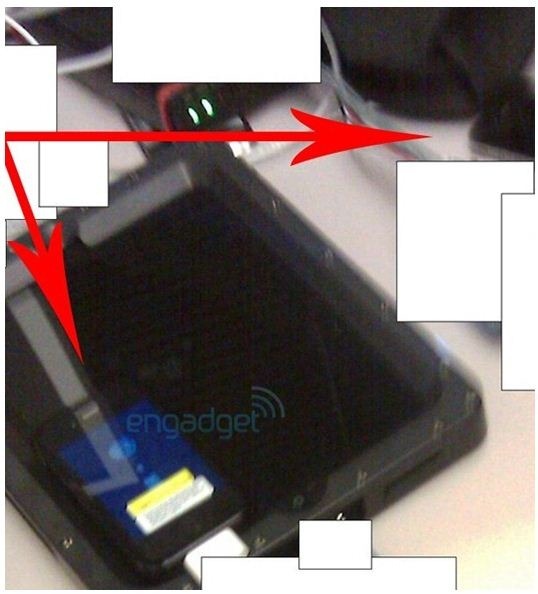 Upon further inspection of these pictures today, the aforementioned editor discovered that the new iPhone 4G we’ve just gotten photos of is actually sitting on the table beside the iPad prototype!Imagine how blown our minds were when we realized we have had a photo of the next iPhone for months! As you can see in the pic above, the left side of the new device is clearly visible on this table in the upper right hand corner, and since we believe that these photos come directly from an Apple testbed, it’s hard to deny that the phone you’ve just seen is in fact the real deal. A source close to Engadget has also confirmed that this is the real deal and it features a higher-res screen, front-facing camera, higher-res camera with flash, and that it takes MicroSIM cards. Thoughts? UPDATE 1: A member on MacRumors forums has posted images from a Chinese site named WeiPhone which further adds to authenticity of this device.